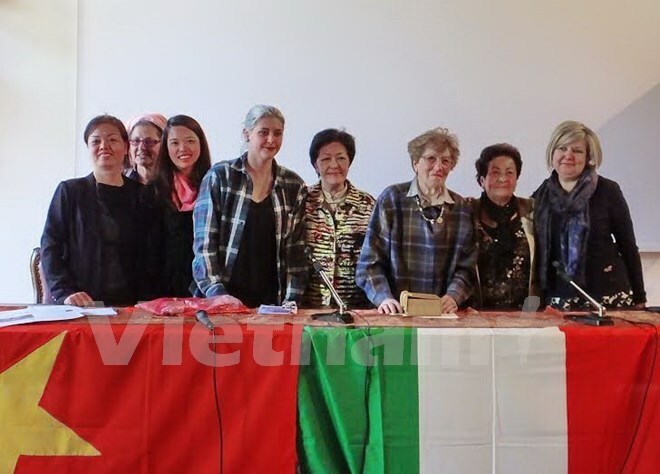 Rome (VNA) – The roles of women during war and peace were highlighted at a recent chain of conferences held by the Italy-Vietnam Friendship Association’s Liguria and Veneto branches and the National Association of the Italian Partisans in north Italy. The seven-day event was organised to mark Italy’s 71st anniversary of liberation (April 25, 1945), Vietnam’s National Reunification Day (April 30, 1975) and International Labour Day (May 1). In attendance were Vietnamese Ambassador to Italy Cao Chinh Thien, Vice Chairwoman of the Vietnam Peace Committee Ton Nu Thi Ninh, Cuban guests, members of Italy-Vietnam Friendship Association as well as locals. In his address on April 26, Ambassador Thien said that the event was significant as both countries were celebrating historical victories in April, adding that this was an opportunity to honour women who contributed to national development. President of the Italy-Vietnam Friendship Association’s Liguria chapter Mauro Cotogno said that Vietnam’s April 30 victory had become a symbol of triumph for Italian labourers, and workers at Genoa port in particular. The event also included an exhibition encapsulating Italian support for Vietnam during the struggle against the US, forums and film screenings on women during war.